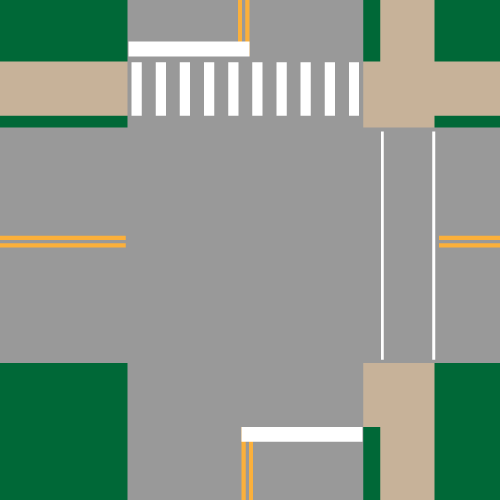 CROSSWALK: (a) That part of a roadway at an intersection included within the connections of the lateral lines of the sidewalks on opposite sides of the highway, measured from the curbs or, in the absence of curbs, from the edges of the traversable roadway, or (b) Any portion of a roadway at an intersection or elsewhere distinctly indicated for pedestrian crossing by lines or other markings on the surface. SIDEWALK: That portion of a street between the curbline, or the lateral line, of a roadway and the adjacent property lines, intended for use by pedestrians. 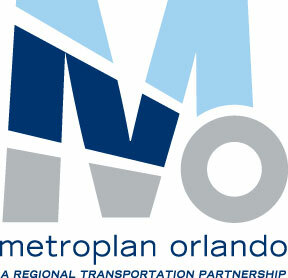 The Orlando metro area has once again received the dubious distinction of being ranked the worst in the nation for pedestrian safety by the Surface Transportation Policy Project’s Transportation for America (T4America) campaign. Their Dangerous by Design report puts four large Florida metro areas at the top of the national list: Orlando, Tampa-St. Petersburg, Miami-Dade, and Jacksonville. Dangerous by Design focuses on how too many of our arterial and collector streets are designed in such a way as to make walking difficult and dangerous. Pedestrian safety experts have noted from observation that motorists are very unlikely to yield to pedestrians in crosswalks at speeds above 30 mph, but of course most of our arterials and collectors are posted at 35 to 50 mph. We have, as a community, abandoned most of our crosswalks. Motorists and pedestrians (and even many in law enforcement) do not really understand what a crosswalk is. 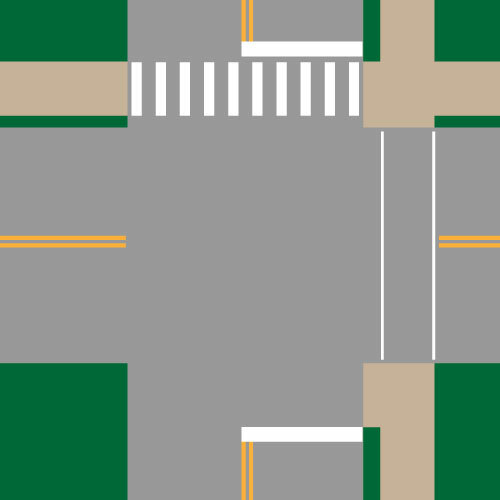 Florida Statutes (based on the national Uniform Vehicle Code) define a crosswalk as the continuation of the parallel lines of the sidewalk across the roadway at the intersection, whether those lines are actually painted down or not. The definition of a sidewalk is broader than just pavement; it’s the area between the roadway edge and the right-of-way line available for pedestrian use. (Imagine you were in Minneapolis in January. How would you know where the crosswalks were with 6 inches of snow on the pavement? There must be some other way to define a crosswalk besides markings.) And this means all intersections, not just the signalized ones. The chance that a motorist will yield to a pedestrian at an unmarked crosswalk is as close to zero as you can imagine. So we are left with only the marked crosswalks being seen as actual crosswalks. But even for those, the ones not reinforced with a traffic signal or a stop sign are rarely recognized by area motorists. I’d say “test it yourself” but I don’t want to be responsible for anyone’s death or injury. Worse yet, some motorists believe a crosswalk is an indication of where pedestrians are permitted to cross the street. A crosswalk not respected by motorists is of little use to a pedestrian. As anyone who has crossed at a signalized intersection in this area knows, and as Keri’s brilliant animation shows, even the well-marked ones with pedestrian signals are routinely violated by area motorists. What is the most common message to pedestrians from local safety professionals? “Be safe! Cross only at crosswalks!” This ignores the fact that pedestrians are permitted to cross mid-block at most locations, provided they yield to roadway traffic. We are left with an environment built intentionally to encourage high-speed auto travel, and that effectively eliminates the pedestrian right-of-way at all but signalized intersections. Pedestrians are left with the choice of greatly extending their walk distances to cross at a signal, or negotiating their way across a number of lanes of high-speed traffic. Since crossing at an unsignalized crosswalk is of no benefit, most cross mid-block; those unlucky enough to be hit get the added insult of being deemed “at fault” for failing to yield right-of-way to roadway traffic. How do we reclaim our crosswalks and make it safe to cross the street again? Flash animation and illustrations by Keri. Your flash animation is so cool. I’ve been there so many times. I think your best insurance is to take dance lessons and be fast on your feet. Love the animation. As Keri knows having traveled with me in major cities including NY, I’m inclined to cross in the middle of the street. Why go out of your way to cross at a crosswalk — especially when it’s a half a city block away — when your destination is “right there?” It’s a habit I formed while working in Manhattan and Philadelphia, and one I’m not likely to abandon anytime soon. > How do we reclaim our crosswalks and make it safe to cross the street again? Actually I have some ideas. I’ll share them in future posts. Just thought I’d throw the question out there in an open-ended manner to see what kind of ideas might come back. Wow… that animation is exactly like the newly renovated intersection at National and Grand in Springfield. The work made life better for drivers and worse for pedestrians. 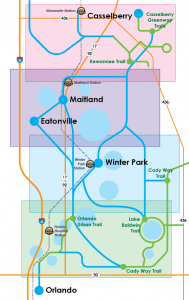 The animation points out a problem I have seen in Central Florida. In other places (like SF), every intersection has two bus stops per street. It is located on the other side of the intersection where the bus is going. Here bus stops are mid-block. That way the bus doesn’t get in the way of the right turn lane, or the cars going past since they don’t want to shift into the right lane until they are past the bus. I know this takes some imagination to understand what I am saying. Maybe I need to make a diagram. LYNX allows for all types of bus stop locations, not just mid-block. Per LYNX bus stop location guidelines at signalized intersections where there are right turn lanes a ‘far side’ stop (past the intersection) is preferred. A ‘near side’ (before the intersection) stop is preferred where the right curb lane is a through lane. Mid-block stops are used where there is significant distances between intersections. In the urban core, LYNX stops are set 2 blocks apart on average. There are advantages and disadvantages to each stop location configuration. San Francisco has made a conscious effort to support public transit and likely has traffic signal prioritization available to reduce the liklihood of a bus having to stop far side right after stopping at a red light. Sadly enough, if it’s a given that motorists won’t yield to a pedestrian in a crosswalk, it may very well be safer in some cases to cross mid-block, as it takes the motorist turning movements out of the equation and improves the pedestrian’s view of traffic. Not only that, but you only have to deal with cars going it two directions. At intersections, cars can come from pretty much any direction. It’s a real pin ball machine, with the pedestrian as the pinball. The mid-block crossing location advantage is being able to deal with cars from just one direction at a time. How about an intersection with the pedestrians crossing similar to mid-block and at low speeds too? That is a roundabout! The median island curves to make the cars slow down and is a handy place for pedestrians to use to make it a mid-block like crossing. Cars moving slowly means they are more likely to STOP for a pedestrian in the marked crosswalk. Roundabouts are the best of both worlds: a mid-block like crossing with cars moving at low speed. Exquisite video. Next trick is to get the motorheads who design the environment, write and enforce the laws, to care. Years ago, in Pennsylvania, a vaguely analogous situation got addressed as follows: PennDOT often posts “no ped Xing signs” at intersections, rather than bother figuring out crosswalk location and signal timing. We fumed for years, but no one cared. Then one day, the director of PennDOT’s safety bureau had to drop off his car for repairs and walk a few blocks to work. He had to walk through three such intersections. Soon after that…. he issued a strikeoff letter stating the practice would stop. There’s a town in VA? or WVA? where the powers that be are proposing that all ped crossing locations require a push button activation, regardless of the ped counts at certain high traffic locations (ped traffic that is). It drives me nuts that I have to push a button to cross most intersections, if I miss the timing by a few seconds or so, I don’t get the walk signal, yet there’s no bloody reason why I shouldn’t be able to cross anyway (and I do, b/c I’m crossing with the light). Another situation that bugs me is the short walk phase and then a don’t walk phase that is out of sync with the light. Yesterday I ran into a situation where the ped signal counted down. I saw that I wouldn’t be able to cross by the time the countdown hit zero, yet waited another minute and a half for the light to change (this was at Orange & Grant at SODO, I was trying to cross Grant). It was a short crossing too. But delaying peds is viewed as a-ok.
From what I have seen in Orange County, the buttons do nothing. The pedestrian light comes on whether the button is pushed or not. Crossing with the green and even with the pedestrian light on can be very hazardous since motorists are turning right and in some cases left across the crosswalk. Even when the crosswalk is marked, they ignore or pretend not to see the pedestrian trying to cross. If the only answer is engineering, what I like is the post you made below, where traffic in all directions is stopped and a no turn on red sign comes on in all directions, but only when the button is pushed. Winter Park has one of those. It is at the corner of Glenridge and General Rees. I’m only familiar with City of Orlando crossings where pushbuttons are required at certain intersections. My commute often requires me to cross Orange Ave at Grant Street near SODO. You only get the walk signal if you push the button. I think the same thing is true at Garland and Amelia, as well as Hughey and Amelia now that I think about it. We had an intersection like that here in Waterford Lakes…Then the brainiacs decided that motorist movement is more important than pedestrian safety, so now the light only behaves like that right before and after the local school is in session. Oh wow. PennDOT is actually stopping that practice? I remember going through PA maybe 7 years ago and it was full of those. Brian is right. Mid-block ped crossings can be quite safe, and they make a lot of sense to allow pedestrians relief from the complexity of big Orlando intersections. Make a place where people walk and they’ll ride as well. Places I ride seem to have both peds and bikes – or neither. I can’t comment on HOW people ride since I only see gutter bunnies, with one possible exception when I was visiting my parents in Seattle last summer. Great topic Mighk. Where I’ve seen lots of peds, cars are more likely to yield. When failure to yield to peds in crosswalks is enforced, cars tend to stop. Basically, make peds more of a priority. Plan for peds, the rest usually follows. Plan for cars/trucks and everyone else is left to rot. In general I’ve observed that when peds, transit, and bicycles are planned for, not just ‘accommodated’, cars manage just fine. But auto-oriented designs tend to make things worse for every other mode and it destroys the urban form. 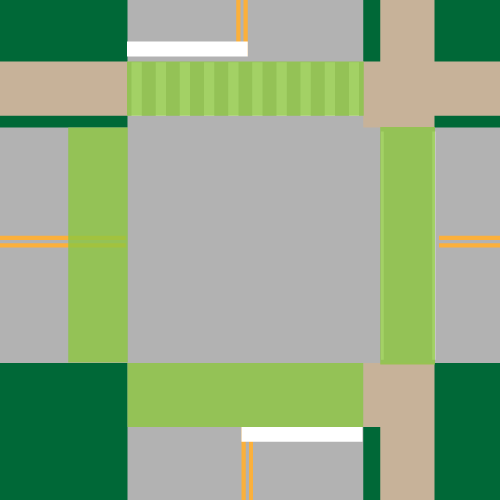 Thought of another idea Mighk – a ped only phase at signalized intersections where peds can cross diagonally rather than make two seperate crossings. I saw these crossing treatments in Oakland and Denver and they worked like a charm. The intersection of Orange and South Street is perfect for such a treatment since the courthouse is a two crossing phase for peds getting off of LYMMO or walking westbound on South Street. We’ve got many intersections just like the one in the animation here in Winnipeg too. To compound it, some of them even have “no pedestrian crossing” signs at the intersections too. I wonder if the anti-pedestrian design of the roads around here (very few sidewalks too) is the root of the problems we have in places where there are crosswalks; people hit the button and step right off the curb without looking expecting the cars to come to an immediate screeching halt. Maybe they’re so used to not having any right of way or consideration that when they do have some they are taking it with authority? i personnally think,crosswalk shouldnt be abolished at all. its a ridiculous thought. 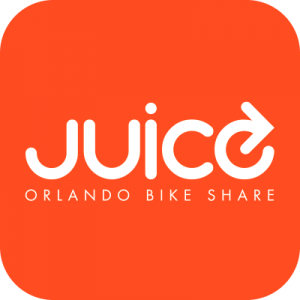 This is great stuff (and I really liked your short video of kids riding to school in the bike bus that posted on Streetsblog Network today). We are doing some animations this winter for Streetfilms again. Hopefully we can do some cool ideas similar to this. Yeah, animation makes a nice complement to video for telling the story. Immediately to the left of the bus stop is a side road. The continuation of the side road’s right of way across the main road constitutes a LEGAL unmarked crosswalk. The animated character needed only to walk a few yards over to cross legally. Looks like I missed the point of the article. Carry on. In Florida, pedestrians can’t expect motorists to yield at crosswalks not controlled by traffic signals (and even there the odds are poor). Yeah, that’s what I meant by me missing the point. I went back and reread your article more carefully and saw that you’d covered the issue of unmarked crosswalks already. I sure wish there were a way to pause the animation. Or at least slow it down! I can right click on it and uncheck ‘play’. Does your version of Flash Player not have this? Yes, I can do that and didn’t know I can and that is useful. Still, a keyboard command would be better (like pressing the space bar).